This product was added to our database on Wednesday 23 December 2009. 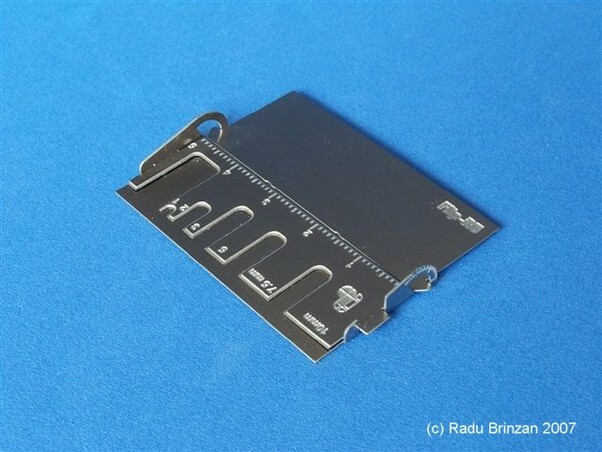 This is a bending tool for photoetched parts. This can bend any commercially available photoetched parts up to a length of 5 cm (approx 2 in). Suitable for all scales and all types of modeling. This tool works on the same principle as the hinged bending brakes that can be found in many metal workshops around the world. The photoetched parts are held in place between the base and the bending attachment, then they are bent by pivoting the hinged bending plate. The tool can also be used in the more "traditional" manner whereby a blade can be used to bend the parts. The tool is made from tough stainless steel and can be easily stored in your toolbox. The tool comes flat packed and minor assembly is required. The office clamps depicted in the pictures are not included in the package, but they can be obtained cheaply from any local office supplier. For most usual bends, finger pressure is enough to hold the parts in place.